Going into this year's JMTR 50 mile race, I had two goals--feel good on the descent of Pajarito Mountain and finish under 10 hours. The first goal was a result of my terrible downhill performance last year on Pajarito Mountain when I went into the race under trained on account of a five week trip to India in March/April of 2008. In the 2008 race I had felt pretty good until I crested the Aspen run and started down the slightly snowy, slick and steep descent and realized I had nothing left in my quads and that it would be a long 14 miles to the finish. I wanted to prove to myself I could do better. My secondary goal of finishing under 10 hours was certainly possible if I had a good race and things went well. When we started the race from the Posse shack at 5am I started out front alongside Ryan Burch as we trotted down the short bit of pavement and turned onto the dirt road. I had met Ryan last year, and maybe even earlier, and knew he was a nice, strong guy and I expected him to win. He and I chatted for a while during the first few minutes along the dirt road and then we cranked down into Bayo Canyon and Ryan was gone! I was thinking he might be going out too fast but as it would turn out, he was way strong and ran a super race out front solo the entire time. Very inspiring. For the first few miles through the first aid station I ran with Glenn Mackie and we also chatted a bit. 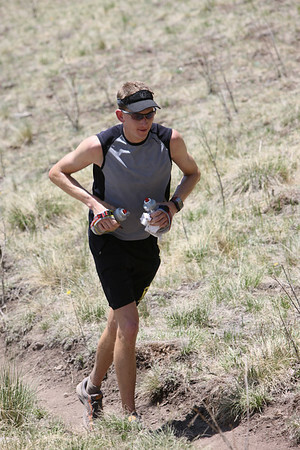 He was coming from Dallas, TX for this race and I was super impressed with his running considering the altitude. But I think it didn't take too long for the altitude to start affecting him and he slowed behind me a bit after the first aid station. I then ran along with Greg Feucht as we ascended to Guaje Ridge and enjoyed a nice sunrise under the cloud deck above. The day was turning out perfect for running with an overcast sky and a cool temperature. It was definitely a bit humid for Los Alamos and I found myself sweating a great deal more than I normally would at 6:00am in the morning. I reached the Guaje Ridge aid station at mile 7.1 at 6:15am, quickly filled my one hand bottle and dropped down the North Mitchell trail into Guaje Canyon. I really enjoy steep, technical descents and I felt I was making good time on the other runners behind me on this section. Down in the canyon the running up canyon was really pleasant and certainly scenic with the stream flowing and a little bit of sunshine poking through the clouds. I ran into the Caballo Base aid station at mile 10 at 6:50am and saw a number of familiar faces working the aid station. I'd later learn there was a bear hanging out near the aid station watching the runners. The out and back run up and down Caballo Mountain was, as always, steep and hard. I ran only near the the start of the climb and near the top and reached the Caballo summit at mile 12 at 7:30am...40 minutes for that climb isn't too bad. The view of Los Alamos and the Rio Grande valley was stellar this morning. I ran down fast but a bit conservatively as I wanted to save some legs for the Pajarito Mountain descent that was 23 miles away. A few downed trees along the trail kept me attentive and in check from going too hard. I was running in second place at this point and feeling good. I refilled my hand bottle at Caballo Base again at mile 14 at 7:47am and headed up Guaje Canyon on one of the two portions of the course that I often consider to be hot. As I neared the top of the canyon and started heading out on the cruising trail towards the Pipeline aid station the third place runner at the time, Dakota Jones, came up behind me and we chatted as we ran into the Pipeline aid station at mile 16 at 8:25am. As I neared the aid station I let out a little whoop to let my family members running the aid station--Mom, Matt and Dylan--know I was coming in. Their aid station is notoriously awesome! The homemade shelter my Mom and Matt made for last year's race was again erected and well-stocked. I wanted to spend more time admiring the well-appointed aid station but I had a long way to go still. I grabbed my second water bottle filled with HEED powder and filled up both hand bottles. I also grabbed my electrolyte capsules and a few gels for the long section through the Valles Caldera, over Cerro Grande and down Cañon de Valle to the Pajarito Canyon aid station. The initial descent from the Pipeline aid station is a steep, loose and sketchy slide down the pipeline "road". I started down with Dakota behind me but it sounded like it was coming down faster than I was so I stepped aside and sure enough, he flew right by me. As we ran down into and through the caldera I was sure to take in the view as it is a phenomnal, wide open place to run. Dakota gained a bit on me through this section and I ran into the awesome Valles Caldera aid station at mile 20 at 9:03am. It was a quick stop for me to fill up my two bottles and get going again. From the aid station the course leaves the nice dirt road and starts out along a cattle trail over a small stock pond dam and then cut cross country to the saddle south of Cerro Grande. As I ran along the cattle trail towards the cross country section I noticed Dakota had missed the cross country intersection and was continuing south along the cattle trail. I whistled and yelled his name but I don't think he heard me. When I got to the intersection I realized the problem...nearly all of the pin flags we'd stuck in the ground had been knocked down and/or chewed up by the elk. I really hoped Ryan hadn't missed this section but I knew he had run this course last year and hopefully remembered where to go. Since I had marked this section of the course two weeks earlier I knew where to go and ran along stopping to pick up and stick the flags that were spaced about every 70 feet or so back into the ground as I knew there'd be 100+ other runners behind us and this wasn't an obvious section of course. Along this section I met Jason Wolfe and then Dakota looked back to see us going across the big meadow and came back to meet up with us for the climb up through the talus, up to the saddle and to the summit of Cerro Grande. On the Cerro Grande summit I stopped briefly to dump some small rocks out of my shoes and Jamil Coury cruised by me there. I was now in fifth place and looking forward to one of the most runnable, nice section of the course--the descent down the great single track of Cañon de Valle. It was a great descent and I was looking forward to seeing my Dad and Allison at the next aid station. I didn't see anyone else on this section and ran into the Pajarito Canyon aid station at mile 28 at 10:46am. I had been hoping to arrive there at 10:30am but was still feeling good and hoping I was running a smart race and saving some juice for later. At the aid station I grabbed a new gel flask and refilled my two hand bottles--one with HEED and one with water--and left the aid station having spent only about a minute there. I always dread the climb up Pajarito Canyon despit the lush beauty of the canyon because it is a notoriously hot section of the course. However, this year the clouds kept things relatively cool and reasonable. I still decided to take off my shirt and run without it to the Townsight aid station and enjoyed the slight breeze cooling me off as we entered the Geist's Gap section of the course. Geist's Gap is a section of trail that was a the brainchild of Bill Geist who really wanted to avoid running the pavement of Camp May road during the race and convinced us to improve an old, faint two track through the forest paralleling Camp May Road. The effort was worth and I always enjoy this section of the course. I followed Jason Wolfe into the Townsight aid station at mile 32 at 11:43am feeling good and ready for the last big climb of the course up Pajarito Mountain. I had hoped to get into the Ski Lodge aid station at mile 36 at noon and realized there was no way that was going to happen. But I was feeling strong and still in fifth place so I wasn't too bothered by this realization. Jason and I left the aid station together and talked briefly as we headed up the mountain. He was making ground on me but I did my best to keep him in sight for some added motivation and that worked well. We held a good pace going up the mountain and over along the crest to the summit and then dropped down the run called Oops! As I descended the run I looked back to see Harry Harcrow and another runner not far behind me. I then looked forward and noticed I could no longer see Jason Wolfe when I should have been able to see him. There was an intersection that left the main trail we had been running along and I assumed he'd missed this intersection so I whistled and shouted his name hoping he'd hear me and come back on track. The wind was blowing now, though, and I didn't get a response. I figured he'd run into runners going the other way and realize the mistake soon though. And now for the moment I had been waiting for...my goal number one. I crested the Aspen run and looked straight down familiar territory. I recalled last year having nothing left for this descent and was super stoked to feel so good as I started down fast and strong. I think I even gained a bit of distance on the runners behind me on this descent this year. I ran into the Ski Lodge aid station in fourth place at mile 36 at 12:44pm to a surprise crowd of my Dad, Allison, Pattie and Roger. Very cool! I loaded up my two hand bottles and grabbed a couple extra gels and beat feet out of there pretty damn quick. The run out Cañada Bonita to the Pipeline aid station was good and I kept a good pace saying hello to incoming 50k runners and passing a number of outbound 50k runners too. As I entered the Pipeline aid station at mile 39 at 1:18pm I again shouted a "yahoo" before my family there could see me so they knew I was coming. At the aid station I utilized the water sprayer that I purchased specifically for the race this year. Dylan refilled my bottles and I was on my way again ready for the final 11 miles to the finish. Oh, but first Dave suggested I stop for a photo with the inflatable durable thick vinyl "love ewe" sheep and I couldn't refuse. Just when you think the climbing is done, there's one more long climb on the dirt road leaving the Pipeline aid station! I tried to run as much of this as I could which wasn't much and I quickly resorted to power hiking. Near the top of the climb I glanced back and saw Harry Harcrow not far behind and this motivated me to run more. Thanks Harry! In short order I reached the turn onto the upper Guaje Ridge trail and enjoyed the nice single track running down the ridge trail to the Guaje/Mitchell aid station at mile 42 just before 2:00pm. Sandy was there to welcome Harry and I we got there and graciously filled up my hand bottle. At this point I realized I wasn't likely to finish under 10 hours because we had about seven miles to go and only an hour to run it to finish under 10 hours. Nonetheless, it was worth a try and Harry was definitely motivated for it. It was out of my sight in no time. These final seven miles can also be brutally warm on the open, treeless lower ridge but heavy clouds and a threat of showers, along with some decent wind, kept things very nice all the way down to the final aid station, Rendija, at mile 48 at 2:48pm. As usual, this aid station run by Maura and Nena had a theme and definitely a party feel to it. This year it was Christmas in May at the aid station! I was pumped up to hear the aid station personnel shouting my name as I came into the aid station and only stopped long enough to gulp down a cup of water. The adrenaline of being so near the finish motivated me to run out of the aid station and start up the hill. As I got near the first switchback I slowed to start power hiking with Nena, Maura and the rest of the crew shouted up to me, "No walking!" Damn! So I picked it back up and ran to the next switchback and slowed again only to hear "No walking!" being shouted again. I was shamed into running again and couldn't wait to get out of sight of the aid station so I could walk! But really the extra motivation got me running the entire hill up to the contouring singletrack back towards the tunnel. Thanks to all you wonderful aid station volunteers! Although I knew I wouldn't make it under ten hours I ran continually through Bayo canyon up to the cutoff up to the final stretch out of the canyon. This final stretch of single track is cut deeply in the tuff and I did end up walking this last climb out of the canyon but of course had to start running again before I turned the corner where everyone would see me heading to the finish. I heard cowbells, clapping and shouting and picked up the pace to the finish line at 10:11:19. It felt great to be done but was especially encouraging that I ran the course 30 minutes faster than I had last year and felt quite good the entire time. As usual my Dad did a fantastic job crewing for me, my Mom, Matt and Dylan did a fantastic job manning the Pipeline aid station and the run was a great success all around. I'm already looking forward to next year where I'll hopefully actually finish under 10 hours! I enjoy earth. Climber, trail runner, sleeping bag sleeper and seeker of fun and adventure. Life's better outside.